Is past success enough of a reason for Canada to stick with Luongo? Roberto Luongo played a key role in Canada winning the gold medal at the 2010 Vancouver Games, but that success has not guaranteed him the starting goaltender job for the upcoming 2014 Winter Olympics in Sochi. 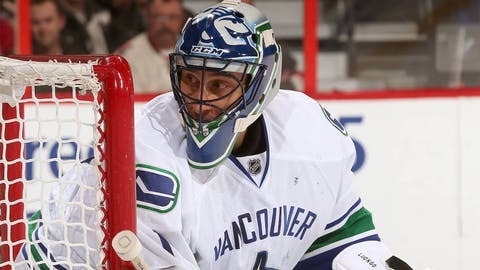 Based on Luongo’s success in 2010, one of his former Olympic teammates thinks the Vancouver Canucks goalie should start in net when Canada opens group play against Norway on Feb. 13. "I think when you win the gold medal, you deserve the chance to defend it until someone takes you down," said New Jersey Devils goaltender Martin Brodeur on Friday, per Tom Gulitti of The Record. Brodeur is a three-time Olympian, a two-time gold medal winner and served as Luongo’s backup in 2010. Luongo is a strong candidate for the No. 1 goalie role for several reasons. He’s played well for the Vancouver Canucks this season with a 16-9-6 record, a .920 save percentage and a 2.24 goals against average. The 34-year-old veteran also went 5-0 with a 1.76 GAA in Canada’s run to a gold medal four years ago. The other top candidate for the job is Montreal’s Carey Price. This season the Canadiens netminder has more wins, and a better save percentage and GAA than Luongo, but Price’s lack of Olympic experience will likely be a factor in the decision on which goalie to start in Sochi. The starting goaltender for Team Canada in Olympic competition is one of the most pressure-packed positions in all of sports. Hockey Canada will announced its final 25-man roster for next month’s Sochi Games on Jan. 7.